This is a great value! These kits ensure that you'll get the job done right. 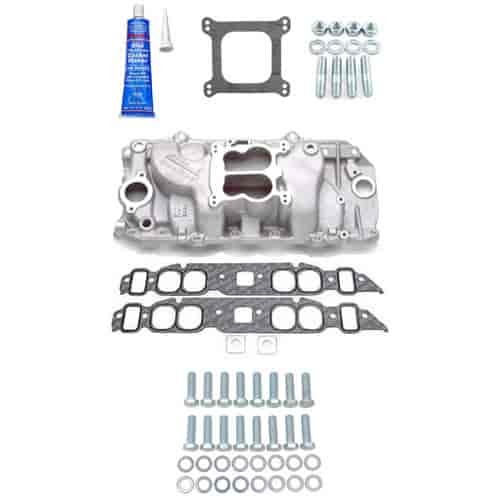 Each kit includes an Edelbrock intake manifold, quality intake bolts, intake gaskets, carb gaskets, a tube of blue gasket sealer and we also throw in a set of carburetor studs. Port Exit Dimensions: 1.70" x 1.68"
Performer Intake Manifolds have a patented runner design that delivers outstanding performance, crisp throttle response, and improved torque over a wide RPM range. JEGS 15840 - Carb Stud Kit 1-1/2"
JEGS 15841 - Carb Stud Kit 2"
JEGS 15842 - Carb Stud Kit 2-1/2"
JEGS 15845 - Carb Stud Kit 2-3/4"
JEGS 15846 - Carb Stud Kit 3-1/2"
JEGS 15847 - Carb Stud Kit 3-3/4"